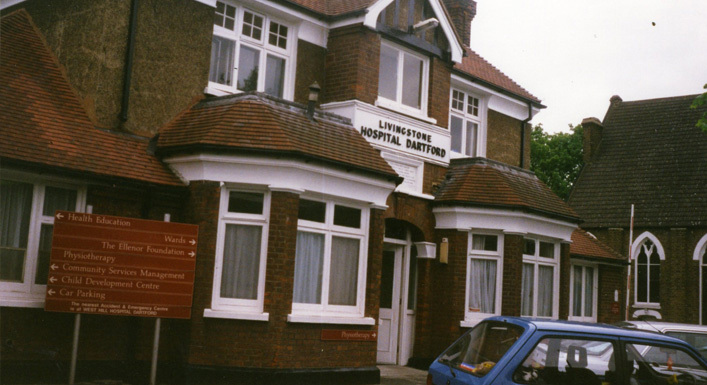 The Livingstone Hospital was a voluntary hospital. The running costs were covered by donations and patients’ fees (fees were reduced if the patient was a contributor to the hospital). Initially the hospital had 16 beds and the £4,000 cost of building and equipment were raised by public subscription. About 70% of the day to day running costs came from a workers’ penny a week subscription. The hospital was named after Dr David Livingstone, the missionary explorer, at the suggestion of Mr Silas Burroughs (of Burroughs and Welcome), the hospitals principle benefactor. The ward names were Silas and Burroughs. The foundation stone was laid by Mr H M Stanley (of the Dr Livingstone I presume fame) and the first patient was admitted on 6th December 1894. An extension was added in 1910 increasing the number of beds to 32. In 1938 a maternity wing was opened by the Duchess of Kent. This was the first stage of a planned modern hospital of 100 beds. Completion of this scheme was interrupted by the war and then discontinued when the hospital became part of the NHS in 1948 and the maternity wing was closed in 1979. The hospital continued as a GP hospital, attempts to close it thwarted by strong public opinion that it is the ‘peoples own’ hospital. It remains open and now houses the local hospice.